4th of July Book Giveaway! In celebration of the 4th of July and our one-year anniversary, we are giving away three copies of Digging into WordPress! To enter, just tell us what you would like to see in the upcoming version 3.0 of the book. We are working on the new version right now and will be updating the book with new information plus everything you need for WordPress 3.0. It’s gonna be awesome! What's up with no more printed copies? We completely sold out of printed books a few weeks ago. We're currently looking into print-on-demand solutions to make more of the printed copies available to those who want them. The problem is that the book is over 400 pages and full color. And POD is pretty much pay-per-use type of thing, so the book would be even more expensive to print than before. So again, we’re currently looking into solutions for this, and want to ask if anyone knows of a decent, reasonably priced POD service. “Reasonably priced” because quality is important. Some quick notes and news about the book! Version 2.0 is here! If you have already purchased the book, you have already gotten an email with a link to download the 2.0 version of the book. If you have been waiting for the print version to come back in stock, the time is now! We sold out of the print version the first round in a matter of weeks. Right about that time, WordPress 2.9 was coming out, so instead of just reprinting more we decided to update the book and print new copies with that fresh information. That is exactly what we have done. 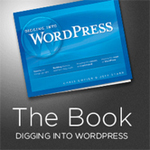 The all-new Chapter 11 of the book deals with new stuff in WordPress 2.9 (and how to use the new features). That chapter will also be the home for future version-specific updates to WordPress. The first printing of the print version of our book is sold out. We are in the process of updating the book to add all the new stuff up to WordPress 2.9.1, as well as some new secret awesome bonus stuff. We've decided to hold off on the second printing until that is ready (next month). When it is done, everyone who has already purchased will of course be getting it as a free update.